As Sonia tore into the bag and began crunching voraciously on these banana chips, she exclaimed "Oh my gosh, these are so good! They're amazing!" Puzzled at her uncharacteristic enthusiasm, I replied coolly, "They're pretty much like any other banana chips I've ever had." "Well, I've never had banana chips before. These are brand new to me," she explained. How someone—a self-proclaimed banana fan nonetheless—can go for 34 years in this country without having a single banana chip, I'm not quite sure. But that's the thing with marriage. Years into the journey, you're still discovering new things about your spouse that surprise you. Admittedly, the surprises tend to have less impact the longer you go—you get the big surprises out of the way in year 1. "You've never had banana chips before?!" carried fewer long-term implications and prompted a much more civilized discussion than "You've got how much credit card debt!?!?" did. But as usual, I digress. Let's get back to the banana chips. As I implied above, I've had them many times before. Mostly in trail mixes. I'm not a particularly big fan of them by themselves, although they're pretty good just dipped in peanut butter. They're a close relative of Trader Joe's slightly-more-exotic Plantain Chips. And just in case you're wondering, the ingredients list didn't get cut off in that pic on the right. That's it. That's the whole thing. And that's what we like to see. 4 ingredients total. No hydrogenated oils like the ones I used to eat as a kid. By the end of the bag, Sonia's enthusiasm for the banana chips waned. I'm pretty sure her initial score would have been a 5. But she downgraded that to a respectable 4. I'm really not a huge fan of banana chips like I said, but considering the simplicity of their ingredients, their convenience, and their snackability, I can't go lower than 3.5. I'm not buyin' that, stevenp. Considering "an artificial flavor chemical" wouldn't legally qualify as a "natural banana flavor." And I'm pretty sure "sugar" is what makes it sweet. 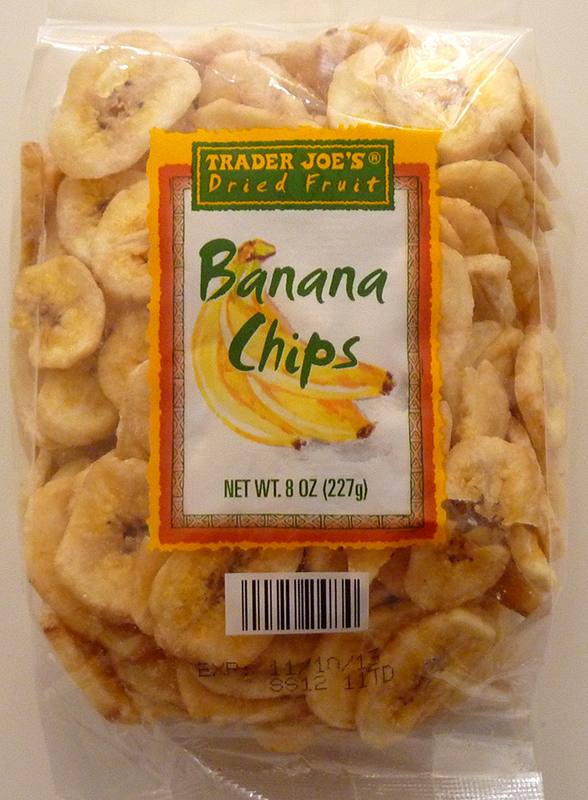 Really, how could someone never have had a banana chip before? And they really do all taste the same... The only thing that really varies is how sweet they are depending on whether they add extra sugar and if they do, how much.